The International School of Oman is a college preparatory k-12 school that follows the EDUGATES® International system which is characterised by highly academic curricula, effective class instructional methods and rigorous programs. Students are tested regularly and frequently to ensure they have learnt the material covered and are provided with extra support to assist them with any areas of weakness. The system is US curriculum-based and adopts a coherent selection of American and EDUGATES® published textbooks and workbooks that are carefully chosen or prepared by EDUGATES® to help the school achieve the advanced academic standards it aims for its students. The curriculum leads towards SAT, TOEFL, and USA College Board Advanced Placement examinations in addition to the Omani General Diploma of Education (GDE). Information technology is implemented in a variety of ways in the school for teaching and learning as well as administrative purposes. The school is equipped with modern educational technology including data projectors in KG and lower primary classes and interactive whiteboards. 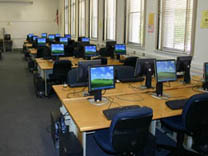 There is a computer laboratory which has a Local Area Network (LAN). EDUGATES® own Advanced Educational Management System (AEMS) is the administrative software used which offers a comprehensive range of modules to facilitate the information collection, storage and communication needs of the school. A software portal is available to parents that enhances school-parent liaison by allowing parents to monitor their children’s performance and to communicate through electronic means with the administration. The performance of every individual is an essential determinant of their progress therefore it is measured objectively and frequently in order to ensure continuous learning and fair assessment. Student progress is monitored in Grades 5 -12 with weekly assessment consisting of specially-designed examinations that are prepared, supervised and marked according to strict procedures similar to external official examinations. Grades 1-4 have mid-term exams and the results are sent home to be checked by parents. The work must be returned to school. KG students take home each week all the work completed during that week. The school has a number of different methods to tackle weaknesses individual students have with their learning and problems of poor performance, as well as programs for more able students. For students who are significantly behind the expected level and in need of individual attention, they are given accelerated learning classes in small groups. These classes allow students to work at a more appropriate level, rather than failing because they are not at the same level as the rest of the class. They encourage students to ask as many questions as necessary to understand a subject or aspects of a subject. Some students may be assigned to student teams where they get the support of their peers. This is operated both inside the regular classroom and as a part of the work of the Academic Department of the school Student Society. Other students are required to take support lessons given by teachers. These classes are timetabled outside regular lesson times and are sometimes temporarily scheduled at the expense of less essential subjects as determined by senior administration. In order to make sure their time is fully used and that they remain motivated, talented students are offered a number of alternatives depending on the subject and level. They may be assigned peer tutoring tasks, offered more challenging work such as exercises and projects that extend their interest and skills and even take additional courses on the approval of senior administration. Students from KG to Grade 4 take no written schoolwork home; however, they are strongly encouraged to read at home every day, ideally with a parent. The last lesson of every school day is reserved for ‘study’. During this time, teachers provide guidance and help to the class as students complete the material assigned for ‘study’. At the same time students are also trained to work independently. The school discourages parents from helping their children with homework or appointing private tutors. When children reach Grade 5 and begin to take home set work, they should have developed and achieved the ability to study on their own, provided a suitable, calm environment exists. The school issues three reports per year - one at the end of each term. These reports must be collected from school and signed for by a parent or guardian. Reports carry school remarks regarding student academic progress and information about general conduct and participation in school life. Parents are encouraged to read the reports thoroughly, praise their children where they have performed well and guide them where they have not. Parents who have any concerns regarding their children are encouraged to call the school and set an appointment with the specialized administrator of the specific grade level. On reports where the administration has concerns about the child’s learning and progress or behaviour, there will be a remark asking parents to arrange an appointment with the administrator.